If you spend any time on Google, you’ve been exposed to a knowledge graph. Launched in 2012, Google’s knowledge graph focuses on public web searches. It is a database of people, places, and things and how they are connected. Try it for yourself. Go to Google and search for a famous actor - Will Smith. What do you see? On the right-hand side of your search results page, you see the knowledge graph for Will Smith: pictures of him, his family, vital stats and net worth, his social accounts, movies he has been in, people connected to him in some way (family, fellow actors, etc.). It's everything you need to know about this famous actor. As people write about Will Smith more, and he makes more movies, his knowledge graph grows. Wikipedia is another example of a knowledge graph. Everything you want to know about any person, place, or topic is there. Both Wikipedia and Google’s knowledge graph save you time when you need to find out as much as possible on a particular subject. What if you could leverage this capability in the enterprise? How valuable do you think it would be? 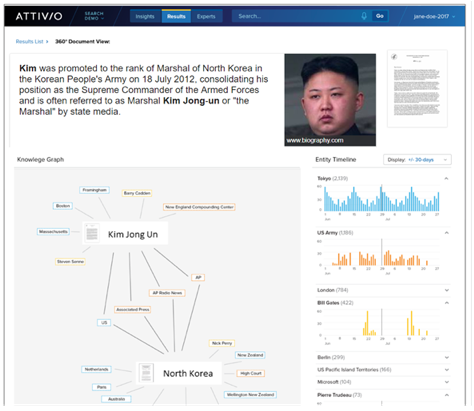 Attivio built its knowledge graph for enterprise search. It defines entities amongst the vast amounts of information collected and automatically figures out connections, letting you explore the graph any way you need to. Consider a pharmaceutical company that makes and sells drugs. You want to see everything about a certain drug, including things like conditions it supports and side effects. Now, what if you want to know what other drugs have the same side effects? Attivio’s knowledge graph enables you to dig deeper into a particular stream and find the connections to other drugs. It sounds simple, but there’s a lot that happens behind the scenes to make the knowledge graph work. For one thing, it’s not always apparent what the focal entity should be. Attivio can analyze a document and extract the entities for you. It does this using text analytics and natural language processing (NLP). It also performs entity resolution, linking an entity across data sources. In the following example, a user queries "Who is Kim Jong-un?" in their corporate portal. In the information returned, not only are text and documents related to the query returned, but also a visualization of the entities and how they're related to the question. In addition, the Expert Finder is a perfect example of the knowledge graph in action. The Expert Finder treats employees as entities and helps you find experts on particular subjects. Information is analyzed, and subjects are attached to employees. The more often a subject is attached to an employee, the more that person rises to the top of a query on the subject. The Expert Finder can also analyze a paragraph and return a list of people who have that knowledge. The Attivio knowledge graph can leverage custom ontologies that predefine relationships. Many organizations, such as life sciences, have their own ontologies and taxonomies that define how information is organized and related. Attivio can take an ontology and apply it to a set of information. But it can do more. Attivio can look at the corpus of data and infer relationships. It can then validate those relationships by analyzing day to day workflow. You don’t have to rely on employees telling the system what is right or wrong; the system analyzes interactions with content and validates the inferences automatically. Attivio is able to request explicit feedback as well, through a star rating system and asking questions like “Is this a good answer?”. The knowledge graph is making a huge impact with enterprise search applications. It enables you to move beyond traditional notions of keyword searches and reading through lists of documents to find what you need, to empowering employees to make smarter decisions faster.